In the Neonatal Intensive Care Unit, Auxiliary volunteer Beatrice Lewis reads a story to an infant whose hospitalization is nearly over. If only they’d let him have one little pet. Despite the volunteer’s engaging tone, the baby’s eyes remain shut during all but a few seconds of the five-minute story, popping open momentarily to gaze at the ceiling and then closing firmly again. One can only wonder: Is there any point in reading to a tiny infant who can’t possibly understand what’s being said? Appearances to the contrary, the answer is Yes. The baby, who had been born prematurely, is being exposed to words that are being clearly enunciated and compellingly delivered—a precious commodity that’s not always available in the NICU. 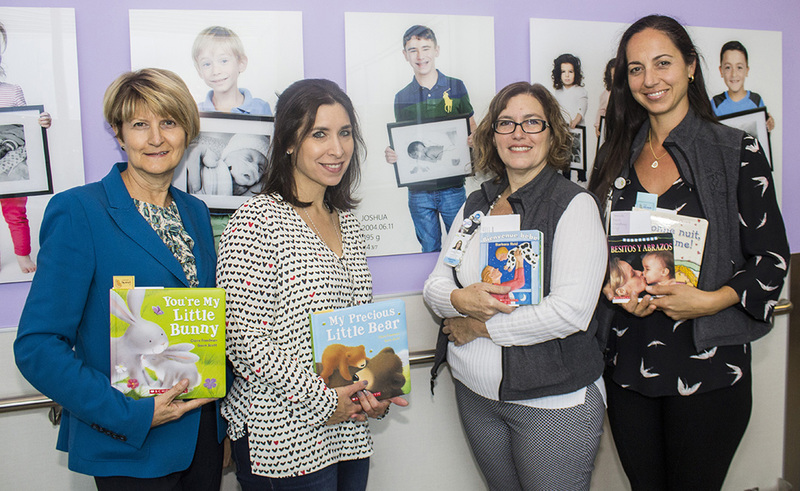 Among those involved in creating and maintaining the Books for Babies program are (from left) Dr. Nancy Feeley, a Senior Researcher in the JGH’s Centre for Nursing Research; Rosaleen Rinzler, an Auxiliary volunteer who founded the Tiny Miracle Fund; Lyne Charbonneau, Nurse Manager of the NICU; and Claudia Cinquino, a Nurse Care Counsellor in the NICU. They are standing at the NICU’s Wall of Hope, a photo display of children who had been born prematurely, but grew into happy, healthy youngsters. The reader, Beatrice Lewis, is a volunteer in the Books for Babies program and has been spinning tales for hospitalized infants since the initiative was launched in June 2018. Every Monday afternoon, along with fellow volunteer Judy Singer, she visits the NICU for at least an hour and makes the rounds, reading to babies who are in incubators and cribs. Parents are also encouraged to read to their little sons and daughters, but if the moms and dads can’t be present, the volunteers step in to make sure the babies get their daily dose of enriched language. “We want to contribute in a way that allows us to have an impact on young lives,” says Ms. Lewis, a Past President of the JGH Auxiliary who, like Ms. Singer, is a retired teacher and a grandmother with a love of books. “Reading is very relaxing for me and I hope this feeling is being communicated to the babies. “Before I begin, I check with the baby’s nurse to make sure that reading to the baby is medically appropriate at that time. Then I spend about five minutes with each child, but not much more, because we don’t want them to get over-stimulated. According to Dr. Nancy Feeley, Senior Researcher in the JGH’s Centre for Nursing Research, newborns—whether they arrive prematurely or at the proper time—may sometimes seem to be unaware of their surroundings, but this is hardly the case. Dr. Feeley, an Associate Professor at McGill University’s Ingram School of Nursing, cites a 2013 study which showed that when mothers spoke and sang daily to their 29‑week-old infants, the babies experienced better oxygen saturation and fewer critical incidents. 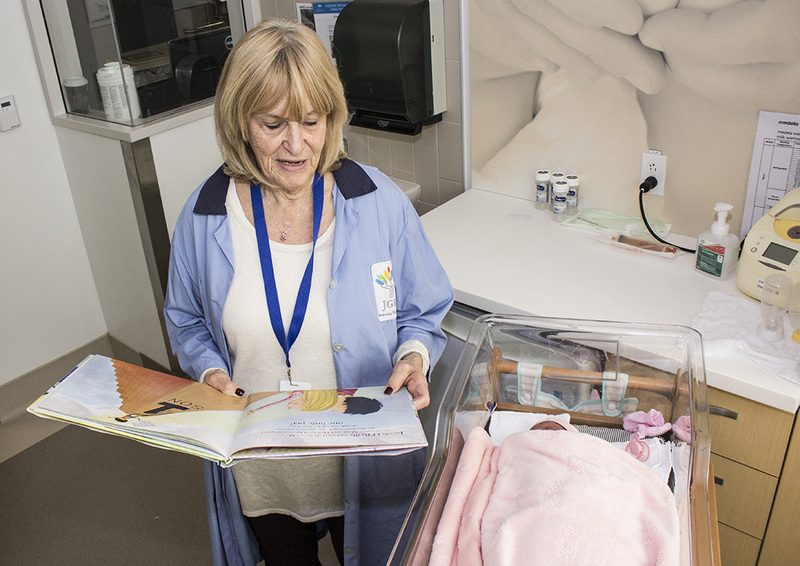 Auxiliary volunteer Judy Singer reads to an infant who will soon be leaving the Neonatal Intensive Care Unit. Dr. Feeley says the placid surroundings of the NICU in Pavilion K are an enormous improvement over the noisy, auditorium-like facility that had previously been used in Pavilion B. However, she adds, infants in the current space—so quiet that it’s nicknamed “the spa”—may not be exposed to enough meaningful language. The remedy is to read to the tiny patients. 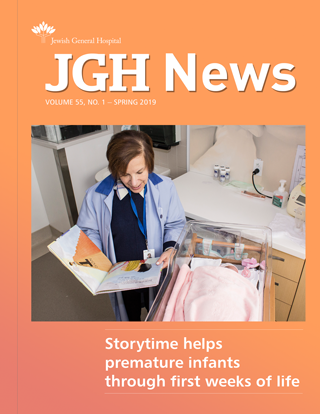 Books for Babies had its genesis in 2017, when Rosaleen Rinzler and her family celebrated the bar-mitzvah of her son, Josh, who had been born at the JGH at 24 weeks and weighed only 495 grams (just over one pound), one of the smallest premature babies to survive at that time. For Josh’s first birthday, Ms. Rinzler, an Auxiliary volunteer, had organized a fund-raising event to buy an incubator for the NICU. But now she wanted to do something really special: establish the JGH equivalent of a reading program for premature babies that had been launched by the Children’s Hospital. That led to meetings with the Literacy Coordinator for the Children’s Hospital, as well as with Lyne Charbonneau, the Nurse Manager of the JGH’s NICU, and Claudia Cinquino, a Nurse Care Counsellor in the NICU. The involvement of Nancy Rubin, Director of the Auxiliary, enabled Books for Babies to come under the umbrella of the Auxiliary’s Tiny Miracle Fund. 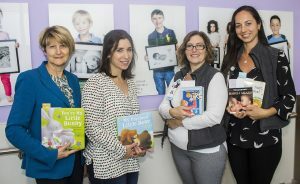 Books for Babies is co‑chaired by Hela Boro and Lucy Wolkove, who are Past Presidents of the Auxiliary, while the Tiny Miracle Fund is co-chaired by Maria Patsatzis. The first batch of books— in English, French and Spanish, with more languages tentatively to be added—was purchased with $2,500 that Ms. Rinzler raised. 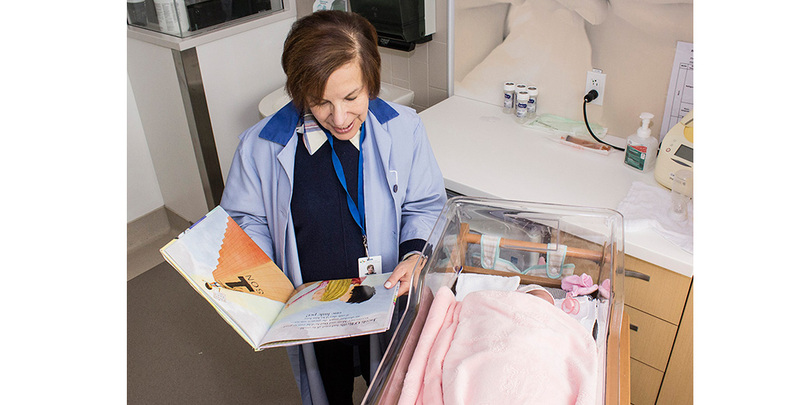 Whether the reader in the NICU has been a volunteer or a parent, the parents of each baby receive a hard-cover storybook to take home, in the hope that the habit of reading aloud will continue. According to Ms. Charbonneau, dozens of books a month have been given away since June, with appreciative parents eager to sit at the bedside and make their voices heard. Ms. Rinzler says that in some cases, the act of reading is as at least as valuable to the parents as it is to their children. “My own son was on a ventilator and wasn’t held for two months, which made me feel helpless. What ultimately matters most, Dr. Feeley explains, is not the content of the story, but the act of reading. She recalls a father who read a Harry Potter novel to his child, because he felt it strengthened the bond between them. And one mother enjoyed reading the Bible to her baby, because this was deeply meaningful to her.